Well, couldn't resist picking these behemoths up when they came up for a very reasonable price. First pair of speakers that the wife got on me for! And can you blame her? 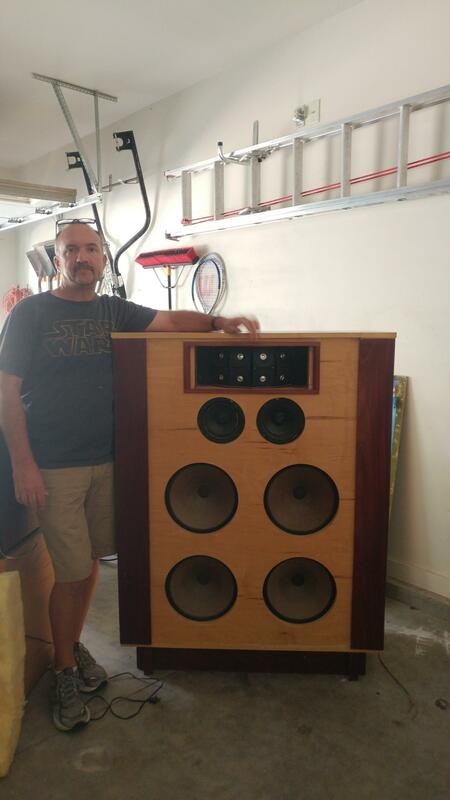 They are the 310AP version of the Concert Grand meaning the baffle panel was sold w/o a cabinet that the owner then installed into a wall or other custom build. The date code has these from 1960 so fairly early. They apparently came out of a church a few years ago and it looks like the custom built cabinet was done fairly close to the Bozak plans for them. There are a few key issues I am going to remedy right away and the material have been ordered including the correct batting (and curtain) and new caps around to rebuild the original N-104 crossover to the newer Tobin version with the addition of an L-pad to help attenuate the tweeter. The batting is recommended to be cotton only so I had to find a big roll of the 2" stuff. apparently the curtain, which is material that hangs top to bottom internally directly behind the drivers, can also be wool so I dug up some wool to try first in that position. Bozak seemed to go through various materials through the earliest years including some Kimsul paper insulation that I found inside these, and finally settled on Cotton materials. As with so many other 50 plus year old speakers the high frequency limitations will be present. This include the earliest X version of the tweeter array which is very limited. Original specs have it extending up to 16,000 but most say it may get up to 10,000 at this point. A later release from Bozak was a little better and can be sourced to replace these, but I am in no hurry there. Some are working on a design to incorporate a modern tweeter option. Some add super tweeters too. 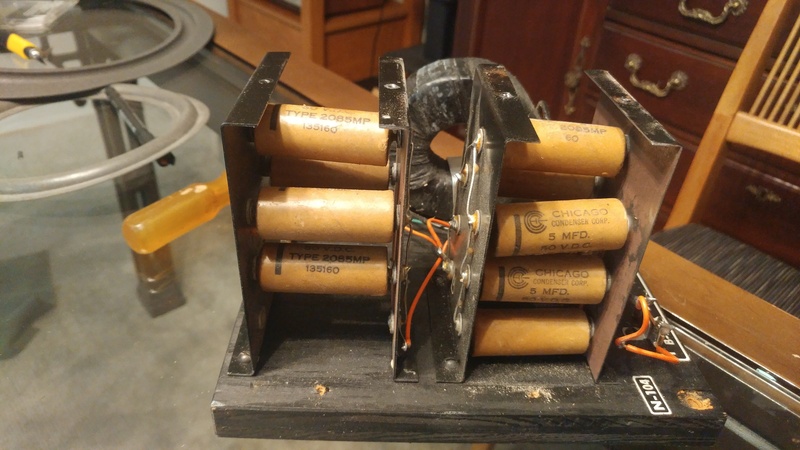 This also has the earliest version of the wonderful B-209 midrange drivers which unfortunately have a damping ring around the edge of the frame that have all deteriorated and now vibrate and make noise when the volume increases. I have been sourcing the the version that cam out a couple years later w/o that damn ring to replace these with. Some folks simply remove the ring and go with that but I figured if I can source the next generation drivers for a decent price, I might as well. 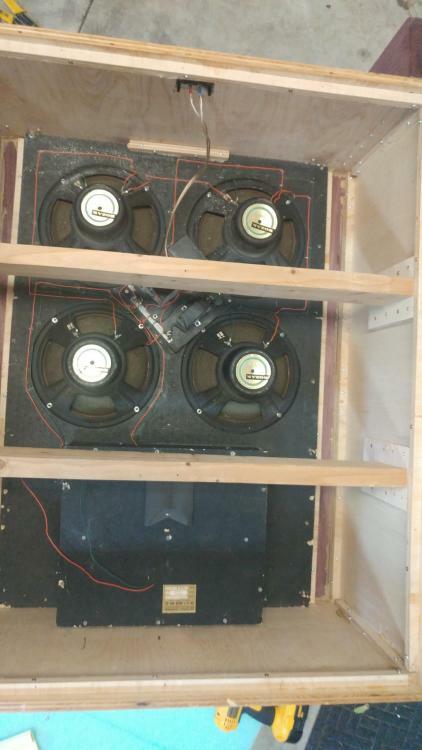 Woofers, all 8 of then are good to go. Impressive, where do they go in your house? How do those old caps measure? Based on their size, I can't help but think you need an amp you can turn up to "11", but they are probably fairly efficient? Well, they are in the garage. I doubt they will find a home in my home. Just want to get them to their potential, see what they can do, then see if I can find someone that wants them. I guess I could put them in my office for a while, but they basically would just be lined up on the wall. A wall of sound! Fairly efficient, but that's a lot of drivers and a decent amount of power is best. I just got the replacement caps and such from Parts Express this afternoon so I hope to dive into these this weekend. Will check those old caps. Also got the replacement batting. Had to order a huge roll of 2" thick cotton and also got some wool to try for the curtain. I can't help thinking these look like highboys on steroids! It is an impressive array of drivers. Good luck, I bet they will sound better with new caps. I hope the batting refurb works out to your satisfaction. Looking forward to your next progress report.